Victor Arano, one of the Phillies' most consistent relievers over the past two seasons, has struggled this spring. BRADENTON, Fla. -- With the hours ticking until the end of spring training, the Phillies had one opening-day roster decision remaining. Victor Arano made it easier. Arano was vying for the final spot in the bullpen and might have had the inside track earlier in camp. But his extreme struggles throughout the spring outweighed his strong track record over the past two seasons, and Arano and Yacksel Rios were optioned to triple-A Lehigh Valley on Saturday night, leaving Edubray Ramos as the team’s eighth reliever. 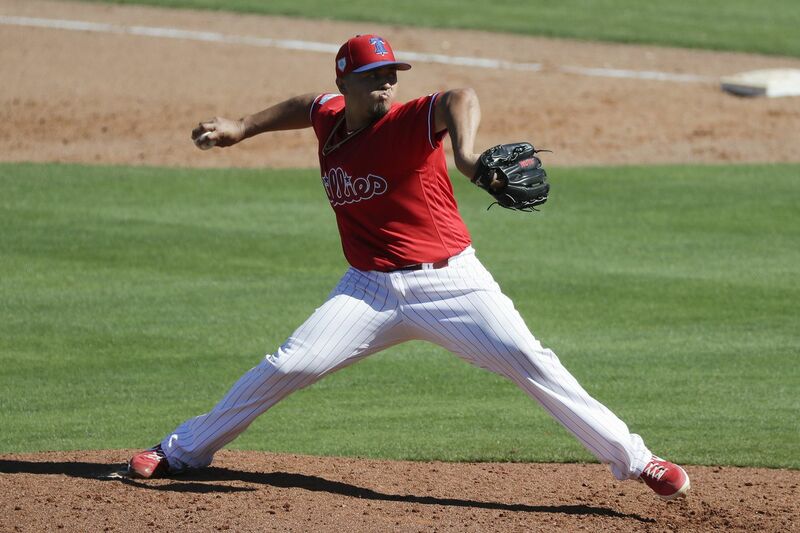 Earlier Saturday, Arano allowed another run in the Phillies’ 5-3 loss to the Pirates. He gave up 20 earned runs on 17 hits over seven Grapefruit League appearances, leaving his ERA at 45.00. Arano, who has a 2.57 ERA over 70 career appearances since making his major-league debut in 2017 and emerged as a high-leverage option for Kapler last season, believes the problem stems from his release point, particularly when he has thrown his signature slider. Ramos, primarily a one-inning reliever, has a 6.75 ERA in seven Grapefruit League games. Rios, a hard-thrower who is less proven than Arano or Ramos, had a 0.82 ERA in nine appearances. David Robertson, Seranthony Dominguez, Hector Neris, Pat Neshek, Juan Nicasio and lefties Adam Morgan and Jose Alvarez have secured their spots in the bullpen. Veteran right-hander Tommy Hunter, who would have made the team, will open the season on the injured list with a flexor strain. "I'm really happy with the progress and how I've been able to get out there and get some innings under my belt," Eickhoff said. "Just keep moving forward." Kapler noted the sharpness of Eickhoff’s curveball. And Eickhoff noted how much he leaned on his breaking ball during a solid stretch in 2016 when he worked with catcher Carlos Ruiz. In his final spring start, right-hander Zach Eflin allowed four runs in 5-1/3 innings. Two of the runs came on a Corey Dickerson homer that was clearly foul. … Infielder Phil Gosselin, a Malvern Prep alum, went 2-for-3 with a homer. Gosselin, who will begin the season in triple-A, is 16-for-39 this spring. … Triple-A lefty Cole Irvin will start Sunday in Clearwater, with Jake Arrieta starting the spring-training finale Monday.